I have a new Linux blog, one which will have articles I would have published at O'Reilly Broadcast (or O'Reilly News or Linux Dev Center) in the past. As most of you know, I wrote/blogged for O'Reilly about Linux from 2006 until May, 2012. O'Reilly's blog sites are still there but they've done away with Linux blogging. I've also written features for DistroWatch but my involvement in the development of a Linux distribution makes continuing there appear to be a conflict of interest. More on that soon. I used to occasionally post about Linux or computing in general here but with all the political posting on the same blog there were some pretty nasty and negative comments. Some people just didn't understand that the two things were separate and had nothing to do with one another. Yes, both sets of posts represented my views, but on very different subjects that should not be conflated. To avoid that problem I've started The Linux Works. As the disclaimer on that page makes clear, it is in no way endorsed or authorized by The Linux Foundation. It simply represents my experiences and opinions as a Linux professional who works with the Open Source operating system each and every day. I'll also be rebooting this blog and my dormant pro-Israel/Zionist blog in the coming days. If you are reading this I hope you will take the time to read and comment on the various posts and articles. Enjoy! Wall Street South? You've Got To Be Kidding Me! The left wing in this country has never been able to tell their friends from their enemies and attack both equally. Sometimes they go after their friends more than their enemies, much to the joy of the right. We're seeing something like that with the so-called "Occupy Movement" (who mostly gave up occupation of parks and the like last winter) with their March on Wall Street South. What is Wall Street South? Why, it's the Democratic National Convention in Charlotte, NC next month. The Occu-tistas seem to have forgotten that it's the Republicans who continually oppose all reform of the financial industry while support for reigning in the excesses of Wall Street come entirely from the Democrats in Congress. They seem to have forgotten that Republicans want welfare for big corporations (like the big oil companies, for example) while cutting any aid to the poor. The Republicans support tax breaks for the wealthiest Americans while voting down anything that might (gasp!) involve government spending to create jobs. The Occupy crowd, which once claimed to represent a broad spectrum of the American population who felt abused by Washington and Wall Street alike, has once again shown that it has been diminished to a creature of the far left fringe. That's been obvious for quite some time now, at least here in Raleigh, where their Facebook page has advertised everything from a Marxist teach-in to a protest against a potential war in Iran and also against any sanctions against Iran. These people are as dangerous to our freedoms as the people on the far right they oppose. Some Occupiers have been saying that there is no difference between Democrats and Republicans for some time despite all evidence and all the voting records to the contrary. Folks on the left who held similar views in Florida handed the 2000 election to George W. Bush. In a state where the election was officially decided by 537 votes, 1.6% of the electorate voted for Green Party candidate Ralph Nader. If most of those votes had gone to Al Gore instead he would have easily been elected President. Once again we face a close election and once again I fear the hard left, either by sitting home or by voting for fringe candidates, will hand the election to a now much more radical right-wing Republican Party. I am certainly a liberal on some domestic issues and on social issues. Let me make one thing clear: I strongly support the Democrats attending the Democratic National Convention. I strongly opposed the leftist protesters outside who are, once again, aiding those they claim to oppose most. "Unlike markets for most products, the inability to pay for care does not mean that an uninsured individual will receive no care. Federal and state law, as well as professional obligations and embedded social norms, require hospitals and physicians to provide care when it is most needed, regardless of the patient's ability to pay. As a consequence, medical-care providers deliver significant amounts of care to the uninsured for which the providers receive no payment. The size of this subsidy is considerable. Congress found that the cost-shifting just described "increases family [insurance] premiums by on average over $1,000 a year." Higher premiums, in turn, render health insurance less affordable, forcing more people to go without insurance and leading to further cost-shifting. Congress therefore passed the individual mandate provision of the ACA to address an economic and social problem that has plagued the nation for decades." These are the facts that the Republicans blissfully ignore when complaining about the cost of the Affordable Care Act. They also ignore the fact that according to the non-partisan General Accounting Office (GAO) 'Obamacare' reduced the deficit by $300 billion, so a repeal would mean higher deficits and more debts. I guess that only matter to Republicans when cutting programs that help the middle class and the poor. A huge tip of the hat to Democratic NC House candidate Watt Jones for providing the quote. Do They Realy Get Away With This? I had about an 80 mile drive each way from the airport in Houston to where I had to be on Thursday and Friday of last week. I also wanted to explore the area a bit so I expected to go through the better part of a tank of gas. A rental car was booked for me with Dollar Rent A Car. When I got to the rental car check in at Hobby Airport I went through all the routine questions. I was asked if I wanted their prepaid gas option, which would mean I wouldn’t have to fill up on the way back. I said “no” because that option is usually expensive. The clerk insisted. He said they charge $3.39/gallon while prices on the street were $3.50 - $3.75. OK, that made it worthwhile. I took it. As I headed down the street to the freeway the first gas station I came to was charging $3.25/gallon. The first one I saw from the freeway charged $3.17/gallon. The clerk had lied to my face to get me to take the option. I was furious. I shared what happened with one of the guys I was meeting. He laughed and said that rental car companies do that to make a few more dollars. Really? This sort of lying to customers is condoned? Is that what customer service in Houston is like nowadays? I hope that manager was honest with me. I hope this sort of thing isn’t routinely tolerated or encouraged. My question is this: how many times has the clerk done this before someone complained? Has he been getting away with it? Do they really get away with this? I had to fly to Houston last week. This was my first business travel in nearly 18 months. I flew out on Southwest on a flight that left on time. That's the good news. Getting to the flight was “a whole lot of no fun.” First, I chose the less expensive daily parking and didn’t realize just how far from the terminal I parked. It was 97 degrees according to my Blackberry’s weather app and I really felt it. I was hot, bothered and sweaty when I got to the nice, air conditioned part of the terminal. I had an e-ticket and only a carry on bag so I used the self service check in terminal and got my boarding pass. Then came the nice, long security line in a part of the terminal that was NOT air conditioned. Aside from the usual hassles, like taking off my shoes and belt and pulling out my netbook, the screening process was uneventful. I was just really hot (as in worse than outside) and bothered and sweaty again. I stopped on the way to the gate area and got a chocolate shake at Cinnabon. I didn’t need the calories but it helped cool me off. Sometime, during the wait at the gate, the air conditioning finally came on. In the meanwhile I was pretty uncomfortable. I texted and called and let people know my flight was on time. Then I eventually took my place in the Southwest cattle call line to wait my turn to board. The flight was completely full. I took less than a minute to get my laptop bag out of my overnight and an incredibly rude man complained that I was holding up people getting on the plane. Tough! I got the netbook out so at least I could keep busy during the flight. Did I mention that it was incredibly hot in the plane? I got really hot and bothered again. Once we were in the air it did cool off and the flight was only a little turbulent, as in not enough to make me feel sick. The one real improvement over the last time I flew was that Southwest now offers wifi on some flights if you’re willing to pay an extra $5 and this was one of them. The landing was smooth. I arrived feeling lousy and stinky but at least I was on the ground. I had to go directly from where I was the next morning to Hobby Airport for my afternoon flight home to Raleigh so I was traveling in a suit. That’s not a great choice for hot weather, is it? Anyway, the security line was long again. I’m still really uncomfortable with the full body scanners, BTW, but I really had no choice but to go through them. I got to the gate and had a nice, extra long wait since my flight was delayed by 25 minutes. There was free wifi but it would intermittently disappear and my connection would go away. There is no longer an afternoon non-stop so I got to take the extra long scenic route via a plane change in St. Louis, now with a short layover. Once I got on the plane it was hot again, though not as bad as yesterday. It could have been worse. It’s supposed to be 107 degrees in Houston on Sunday. I got out before it went from really hot to insanely hot. The take off and early part of the flight was quite turbulent, as in bad enough to induce nausea. Once the turbulence passed I felt better. I was even able to eat the complimentary peanuts and drink a cup of cranberry juice on that first leg of the trip home. That may not have been such a great idea as airplane lavatories are as disgusting as ever. There was no wifi on this flight. Landing was somewhat more turbulent than take off. I can imagine my complexion turned to an interesting shade of green. There was no risk of missing my connection at St. Louis. I originally had an hour and a half layover. Of course, the flight to Raleigh was delayed too, this time by 20 minutes, so I had plenty of time at the airport. Take off this time was uneventful but once again the flight was full. I was also surrounded by families with young, screaming and/or crying children. Thankfully I had headphones and plenty of music with me. There was no wifi on this flight either. All in all I got home around 10:30 PM and was asleep half an hour later. This was a stressful little trip even without the flights. I must have been both emotionally and physically exhausted. I woke up around 2:15 the next afternoon. I still hate flying. Like most I.T. professionals I get contacted regularly by headhunters and recruiters who would like to place me with their clients. I also participate in a number of Linux related groups on the business social networking site LinkedIn. I do try to keep abreast of market conditions and I do read job postings now and again. We all know that the U.S. economy is still creating jobs at a relatively slow pace, salaries are down at least a little, and even in I.T. many good people are looking for work. One of the net results is that a company or recruiter can get inundated with résumés for a given position. Companies can and do put out long wish lists of skills and experience to reduce the number of applicants to those who most closely match the position and related positions within their I.T. departments. That's all well and good. However, sometimes those desired or required skills effectively reduce the pool of qualified people to zero. • 8+ years working with RHES v5.x+ and CentOS v5.x+ Linux systems administration. The first public beta of Red Hat Enterprise Linux 5.0 was announced on September 7, 2006. Nobody on the planet has that level of experience. Eight years ago RHEL 4.0 wasn't even released yet. It's even worse for Microsoft admins. I saw a position demanding 10 years of experience or more in SQL Server 2008 and Office 2010.
Who writes these requirements? Can't they read a calendar? I guess basic math is not a requirement to work in some HR departments or as a recruiter for some companies. Ridiculous doesn't even begin to describe this and yet I see things like this over and over again. A Mitt Romney supporter this morning on NPR: "We need to get rid of ridiculous organizations like the EPA, Muslims and unions." Since when is Muslims an organization? I thought it was a religious affiliation. So, what this Republican was saying is we need to get rid of freedom of religion, at least for religions he doesn't like. Lovely. I'd want to keep the other "ridiculous organizations" too. It's simply frightening how many know-nothings we have in this country on both the right and the left. "9 percent of people have already cut the cord and 11 percent are considering doing so because they can watch almost all of their favorite shows online." Those same people might find they could get some of the remaining programs with an antenna. I ditched cable when I moved to my present apartment almost a year ago. I was looking for ways to cut costs during a time when my income has been a bit erratic. Since digital television came along stations multicast, which means many TV stations now have 3 or 4 channels where they used to have one. I can pick up somewhere around 40 channels where I live in Raleigh. Some of the channels I receive are considered to be outside the Raleigh-Durham market and are not offered by cable or satellite in this area. My best friend in Franklin Co. (where I used to live) picks up about the same number, though the list is slightly different. 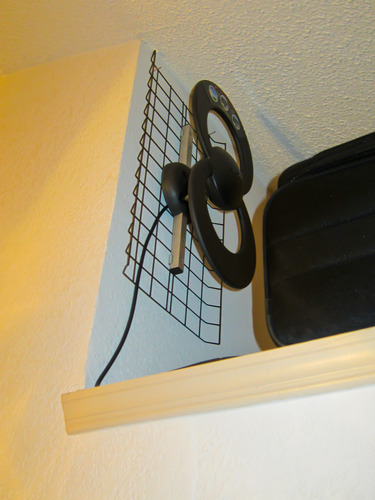 My antenna, an Antennas Direct ClearStream 2, is indoors, sits on top of my entertainment center, and gives me perfect HD reception. I live in a second story apartment. That's a stock picture. Mine sits sideways as I have very limited space between the top of the entertainment center and the ceiling. It works just fine on it's side and the extra height did seem to help a bit on one more distant station (4 channels). One month on HD cable costs as much as the antenna, which can also be mounted outdoors with even better results. As a renter in an apartment that just isn't an option for me. There are also lots of opportunities to stream programming from the Internet for free. For example, CNN had free streaming of the last Republican debate they carried. Most of the networks will let you stream any episodes you missed from their websites as well. Hulu also offers lots of free programming including many cable programs. If that isn't enough for you the add HuluPlus or Netflix for less than $10 per month. It's a lot cheaper than cable. I get all the TV I want to watch for free. I can't imagine ever paying the cable company again.